It's a rare teenager who puts in overtime. Kelsey O'Leary is that teen. At age 12, Kelsey was diagnosed with scoliosis and fitted with a brace by Mayo Clinic physicians. The Rochester, Minn., girl wore the brace day and night — logging more than the recommended hours — for three years. Kelsey, now 17, and her parents, Amaria Najem O'Leary and Patrick O'Leary, credit her perseverance with a remarkable outcome. After three years of bracing, the curvature of Kelsey's spine was improved — an unusual result for a treatment that is designed to keep spinal curvature from worsening. "I was really surprised and happy about that," says Kelsey, a theater and arts aficionado. "I was always told that bracing doesn't cure scoliosis, but it did actually improve the curvature of my spine, which is very rare." Without a brace, scoliosis patients learn, the curvature of their spine will continue to become more pronounced. In appropriate patients, risk of progression is reduced from 80 to 20 percent with bracing, says Anthony Stans, M.D., a Mayo Clinic orthopedist who, along with his fellow specialists, has as many as 75 patients at a time in braces. Children are typically diagnosed around the age of 11 or 12. For Kelsey, the scoliosis warning came during elementary school. During fifth grade she was screened at school. Her spine was flagged as being "a bit off," she recalls, and her parents took her to Mayo Clinic for an exam. At that time, physicians determined she didn't require treatment. Two years later, though, her spine's curvature had gone from a measurement of 16 degrees to 24. After three years of wearing the brace, Kelsey's measurements went from 20 to 11 at the top of her spine and from 25 to 18 at the bottom. Only about 10 percent of patients show "measurable improvement" in their spine's curvature, according to Dr. Stans. "Kelsey had some permanent improvement in the curve," he says. "The usual expectation is that we prevent it from getting worse." Kelsey, though, fell into that rare 10 percent. When children are initially outfitted with a brace, they wear it for a few hours per day. Gradually, they build up to wearing it 20 hours per day. Most middle and high school students want to be regarded as "normal," and walking around nearly full-time with a brace is hardly ideal. Kelsey, though, quickly decided she had to overcome any tendency to feel sorry for herself. "I didn't know how the brace would affect my life, and I was worried about that," she says. "Would I not be able to do the things I want to do? I was worried in the beginning, but I realized it was for the good of my back to wear it." Dr. Stans says scoliosis patients who wear a brace can largely continue with their regular lives and activities -- even sports. If they aren't wearing the brace during those hours, they simply need to wear it during another time of day. Kelsey continued with her dance classes after being outfitted with the brace. Those hours, though, accounted for her time out of the brace each day. Wearing the brace was uncomfortable at the outset, Kelsey says. 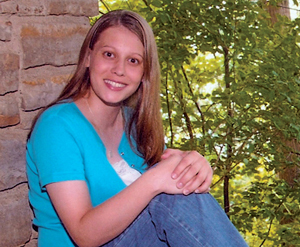 Her mother recalls that the first time Kelsey had to wear the brace she left the room. Patrick aided Kelsey instead. "It was so hard to see her strapped into this contraption," Amaria says. "But in time it became something you didn't even pay attention to." In fact, toward the end of her three-year stretch, Kelsey slept with her brace on even when it wasn't required. She'd grown so used to wearing it that, without it, she had trouble sleeping. Kelsey's positive outlook on her treatment for scoliosis was shaped in part by the approach Dr. Stans took with her in discussing the brace. "He said it wasn't my parents' decision," she remembers. "It was mine. He said it could affect the rest of my life, and I've got the choice. I liked that." Dr. Stans says the "it's your choice" talk is a staple for him with kids who are diagnosed as needing to wear a brace. "It's empowering for them," he says. "It's not some adult telling them what to do. And when you explain things to them in a calm, reasonable fashion with some evidence, patients will almost always make the right decision." Kelsey and her mother agree it was the right choice for her. Kelsey's spine is lovely now, Amaria says, and gives her the posture she always should have had. Now free of wearing her brace, Kelsey says the treatment was worth any discomfort and minor lifestyle adjustments she's made. She's thankful her diagnosis was made early enough that her spine could be treated. Kelsey became such a champion of scoliosis treatment that she wrote a paper for school on the subject. Scoliosis screenings are no longer performed in elementary schools, she found. That discovery unsettled Kelsey greatly, given her experience with early detection. The high school senior says screenings should be done in elementary schools, as they were when she was young. For children diagnosed with scoliosis and told they need to wear a brace for three years, Kelsey has an encouraging response. "Attitude is very important," she says. "If you go in thinking, 'I hate this, I don't want to wear it,' then the results won't be as good as if you say, 'This is good for me, I can do this, I will do this.' I decided I'd wear it as much as I could so maybe I'll have the same spine as when I went in."